Dr Emily Falconer is our newest member of staff, joining the Sociology team in September 2015. Here, she discusses one her favourite and most influential books. Nominated book: Ahmed, S. (2010) The promise of happiness. Duke University Press. 1. Why have you chosen this particular book? I was completely blown away by The Promise of Happiness the first time I read it. And I continue to be blown away every time I re-read it. It is a firm fixture on my book shelf. Sara Ahmed’s writing (and talking- her lectures and keynotes are phenomenally unique) has that incredible skill of touching each reader personally, resonating with each of our own lives, intimacies, emotions, experiences and histories, whilst simultaneously exposing these feelings as deeply political. Sara Ahmed truly dissects what it means to be happy in our society. Most importantly, she gives permission to be unhappy when we are faced with social injustice and issues that – quite rightly- evoke emotions of anger, fear or unease. All too often the pressure to be happy can mask social inequality; Ahmed concludes that perhaps the truest happiness comes from the freedom to be unhappy when we need to be. Never again will you be able to feel happiness or joy, or anger or shame, without contextualising it in wider social contexts! For many, this is a great revelation, and indeed a tremendous relief. 2. How do you draw on this book/article in your teaching? Level 5 Module: SSOC509 Emotional Life: Psycho-Social Dimensions of Self, which begins next semester, will have an entire section on ‘The Imperative to Be Happy’, and Ahmed’s work will feature heavily. I regularly use theoretical concepts of happiness, as well as wider sociologies of emotion in my own teaching and research. I find students can really relate to these concepts, as we all feel happiness, anger, fear and shame at different times. We often, however, attribute these to our personal lives and circumstances, instead of reflecting on the deeply embedded social contexts in which they produced. Emotional Life: Psycho-Social Dimensions of Self unpacks the sociology of emotion, and makes us review our feelings in a different light. 3. Have you any tips or suggestions for students interested in finding out more? Yes! 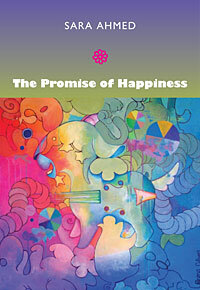 Firstly, read Ahmed, S. (2010) The promise of happiness. Duke University Press. This paper follows the emotional management of lone, independent women travellers as they move through tourist spaces, based on my doctoral research Embodiment and Emotion in the experiences of independent women tourists (2012). Specifically, this paper will focus on ‘gendering happiness’ by arguing that women travellers are significantly compelled to feel and display characteristics of happiness, humour and ‘learning to be Zen’ in order to be successful travellers. The imperative to become, and remain, happy and humorous in the face of embodied, emotional and gendered constraints is a key feature of women’s reflections of their travelling experiences, mirroring the recent emergence of literature into happiness and positive thinking within feminist theory (Ehrenreich 2010, Ahmed 2010). This analysis begins with influence of women’s guidebooks and travel literature on particular discourses of emotion, before providing rich, original narrative data from field research. Negotiating ‘bad’ emotions provides a powerful insight into the perceptions of women travellers, yet the imperative to remain happy can mask problematic power relations and other forms of resistance. This is not to say that emotional negotiation is not partly a form of effective resistance in itself which enables women to experience a greater degree of stress-free travelling mobility, rather, as Ahmed suggests, I wish to make room for the freedom to be unhappy and angry in travelling space as a crucial part of their reflections of the social and geographical conditions of their gendered identities, without feeling failure for not achieving a successful travelling identity. Great book hint, will be ordering ASAP!